Determine which roles limit the view and modify permissions for the fields. Determine which fields you want to limit for each role. If you're only restricting access to one field, this method is usually the easiest (though both will work). Open the table you want from the Table bar, then click SETTINGS in the Page bar. Click Advanced to expand the section. 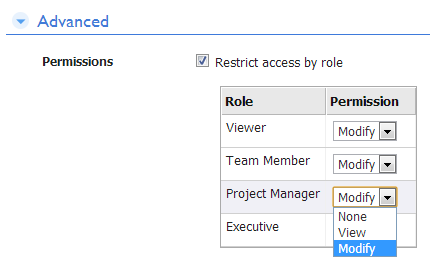 In the Permissions section of the page, select the Restrict access by role checkbox. Click the role whose access level you want to control. In the Fields column, click the arrow, then select Custom Access from the list. Quick Base displays a list fields. Type the name of the field in the Search by field label box to find the fields that you want. Click the Show arrow, then select the type of fields that you want to select. 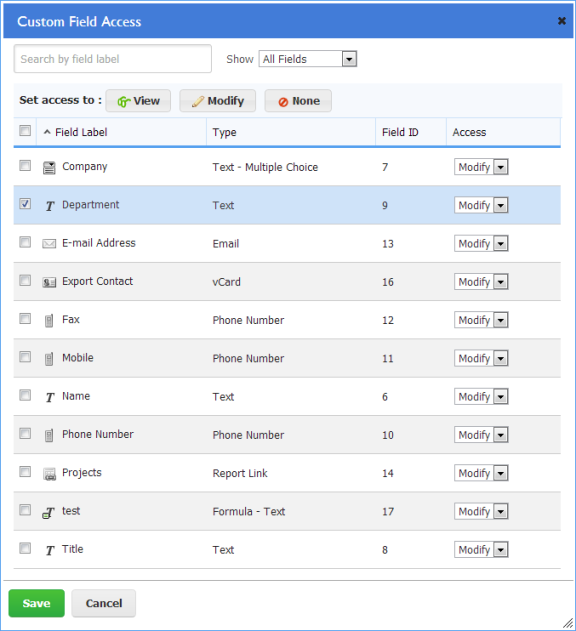 Learn more about filtering and sorting fields.